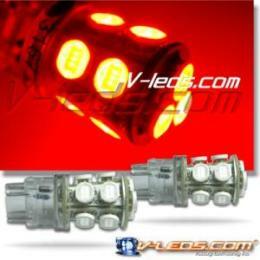 LED replacement bulbs have and still are evolving very fast... none are D.O.T. approved yet that I know of, so use them at your own risk. Some of the benefits of LED bulbs are a deeper, purer light; "instant-on" illumination; less power consumption; and a supposed life span of 10 years continuous burning. 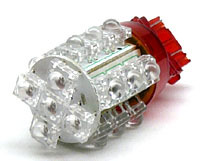 The LED bulb rule of thumb for color is to match LED color to your desired color - red LED behind a red lens, and amber LED behind an amber lens. This is because "white" LED's put out a blue-ish tint light, nothing like the yellow-ish glow of a "white" incandescent bulb, giving poor results. Most cars that use a thermal flasher system will need its thermal flashers replaced with electronic ones, due to the much lighter load the LEDs put on the flasher. 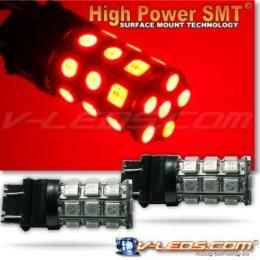 Some vehicles, including newer panthers, use LCM (lighting control modules) which are easily confused bu LED bulbs. The use of heat producing load resistors is one fix for this, but is not recommended by myself. Some people have no problem using LEDs with the LCM, but I have no experience with this. You can find all of the following replacement bulbs on eBay - the only source for the good ones I have found. 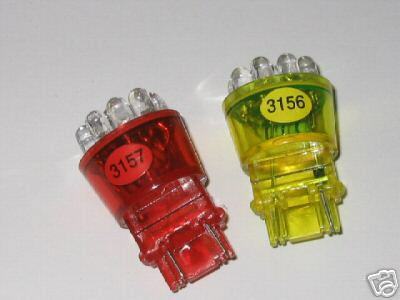 Just search for your bulb # and "LED"
Now that that's out of the way, here's some of the next wave of LED bulbs that came out - I have these type in my 85 crown vic, as seen in the pics. These look incredible at night, but don't appear as bright in direct sunlight. If they are less bright than regular bulbs is debatable, I feel the difference is minimal. The "5 star" 194 replacement shown above also work very well for dash illumination, as show below in my 85 and 91 crown vics. 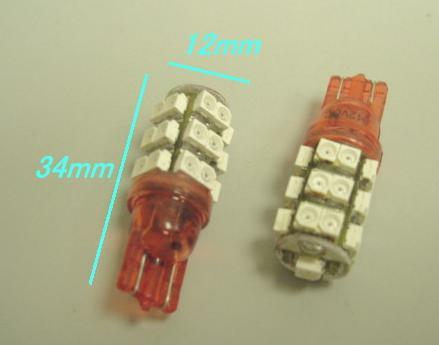 All blue you see in the pics is from these type of bulb replacements, except for the aftermarket gauge illumination. In the pic of the 85, the A/C control is not LED, but has since been swapped and also works very well. There are even newer, brighter, more high powered bulbs available - even though I have no experience with them, Im going to go ahead and classify them as "best"
The previous info has been of my personal opinion - individual results may vary!! !